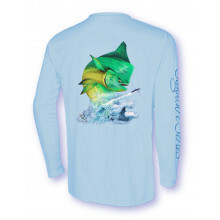 Rick Bogert Signature Series Performance Long Sleeve Long-Sleeve Crew Neck offers superior sun protection and performance qualities. Featuring ProtectUV® Mega Solar protection with WiKZ® moisture wicking and ZYPTRON® stain release by Denali. Signature Series offers a wider cut and for all body types and sizes. All graphics for the Signature Series line of apparel are high quality screen printed with superior quality and durability.